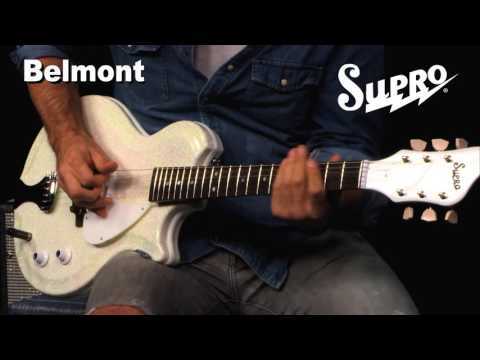 The Belmont is a reproduction of the single-pickup, Sparkle White fiberglass Supro electric guitar that was manufactured in Chicago during the early 1960s. The Belmont Vibrato reissue mates a chambered body with a newly developed, composite “Acousti-glass” top. This updated construction preserves the instrument’s signature aesthetics and timeless sound while improving its semi-hollow acoustic resonance and tuning stability. The Belmont Vibrato’s vintage-correct tuners, dobro tailpiece and adjustable rosewood bridge are joined by a faithful replica of the legendary Vistatone pickup to bring you a fully realized and worthy reissue of this classic Supro guitar. The Vistatone pickup found in the Supro Belmont is a reproduction of the groundbreaking, single-coil design developed for Valco by Ralph Keller in the early 1950s. The Vistatone pickup is cited as prior art in Seth Lover’s PAF patent and is found in many of the most desirable vintage Supro models. The Supro Belmont has an electric tone that is pure 1960’s rock ‘n’ roll, with an aggressive mid-range voice that does not sound like any other instrument.